Fundraisers to fill your thermometer! A fundraising thermometer helps your group keep track of your earned money, while also working as an encouragement for your teammates as you work toward your final goal. Below is some information on where to purchase or make one yourself. 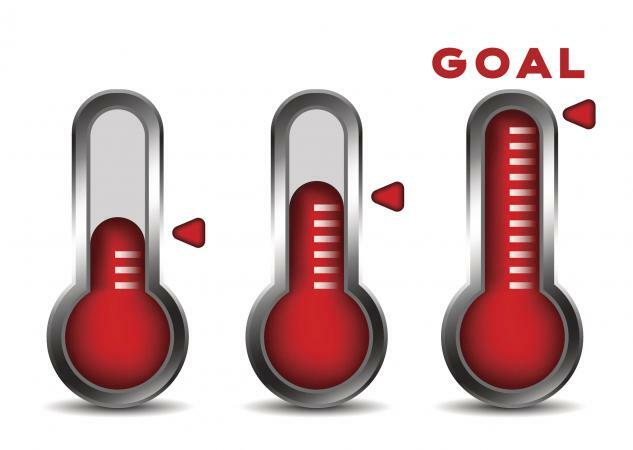 A fundraising thermometer is a really simple concept. A graphic of an oversized thermometer is printed on a piece of large white paper, or comes as a cardboard cutout. On it you will find various financial markers indicating different levels of earnings. As your team raises funds, you color in the thermometer up to the marker you've reached. When you've reached your goal, you will have a fully colored in thermometer and perhaps even earn a little extra to throw your group a congratulatory celebration! Making a fundraising thermometer isn't very hard, and chances are you can find someone within your organization who is able to do so. Simply draw a thermometer-shaped outline with a thick-tipped black marker large enough to cover a piece of white poster board. If you wish to cut out the outline, you can do so. Next, with a fine-tipped black marker make evenly spaced horizontal lines up one side (or the middle if you wish) of the thermometer. Next to these lines, right in amounts, starting with $0 on the bottom, going up to the top line which is your goal amount. For example, if your goal is $1000, you may want to write $0, $100, $250, $500, $750, 1000, with smaller lines in between denoting transitional totals. With a red marker, crayon or colored pencil, shade in the base of the thermometer on up to the line you have reached. This will easily denote the amount of money you have earned so far. Take your thermometer and post it onto a wall or bulletin board where your whole group can see it, discuss, and be encouraged. There are also various places to purchase one of these thermometers. The advantage of this is you can reuse them, such as the one found at Trainer's Warehouse, which contains an erasable whiteboard surface. Light enough to hang on a wall or easel, this thermometer can be brought out for every fundraiser your group has throughout the years. You can also find them at your local learning/teacher supply warehouse, as well as occasionally at home stores. Fundraiser Insight also has a great article on alternative thermometers including pie charts and specially themed designs. No matter where you get your fundraiser or what design you opt for, the most important part is working hard toward your goals so you can fill in that red and enjoy looking back on your financial achievements as an organization, providing the resources you need to move forward with more important matters - the ultimate purpose and agenda of your group.